Makkays is an authorized and exclusive distributor of ‘AXON’ CABLE, the manufacturer of wires, cables and harnesses for advanced technologies, offering complete interconnect solutions for a wide range of applications: general industry, consumer, automotive, aeronautics, space, military, telecommunications, medical, research centers and oil industry. 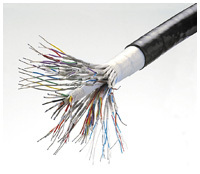 AXON’ CABLE has brought its expertise in the manufacture of precision conductors, wires and cables together with its knowledge of overmoulding techniques and EMI protection to be able to offer solutions suited to customer requirements. 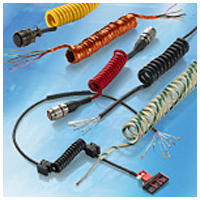 Axon’ Interconnect department offers specialized skills in the termination of single, hybrid, round or flat cables with different types of connectors irrespective of the application. 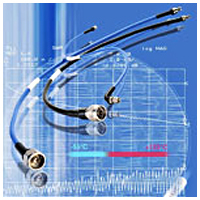 Axon' offers an extended range of multi-strands, high flexible wires and cables for any applications requiring extreme flexibility and resistance to high temperatures. Severe operating conditions in very limited spaces may create demanding routings for the wires and cables with very small bend radius. 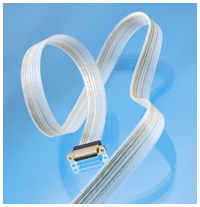 Axon' offers a range of highly flexible multi-conductor wires and cables called Flexible Wires (FW). Axon' design and manufacture composite cables specially designed to meet customer requirements irrespective of the application. They are able to resist the most demanding electrical, mechanical and environmental requirements. Custom design cables and cords axospiral® can be used for any electrical connection involving portable devices and moving equipment where flexing would cause damage to conventional wire and cable constructions. Axon has designed a complete range of low loss microwave coaxial assemblies. They are mainly used as measurement and equipment assemblies as well as for antennas. Axon' has developed picocoax® a complete range of miniature coaxial cables and harnesses for applications where a large number of signals have to be transmitted with no interference. Quasi-Flex is a range of hand formable cables which can replace semi-rigid cables whilst retaining similar electrical performance. They have been designed for antenna systems. Flat Flexible Cables (FFC) consists of flat tin plated copper conductors laminated between polyester insulating films with reinforced ends. They are used as board to board interconnection in electronic systems. 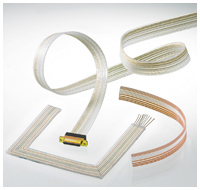 Axon’ offers extruded flat cables with round conductors for any application requiring space reduction and temperature resistance. 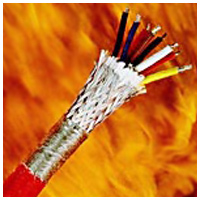 VIBRAFLAME is a range of cables designed to resist extreme temperatures ranging from -196°C to +1565°C. The range of cables has been designed to avoid propagation of fire and emission of toxic fumes in public places and industrial facilities in case of fire. Axon’ together with addix, the electrometric subsidiary of the group offer flexible fluoroelastomer cables. They have been designed to be used in environments where resistance to heat and chemical products plays a major role. 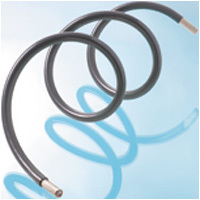 Flexforce™ power cables are composite cables designed for military applications where high currents have to be carried. Very good resistance to cut-through. Temperature resistance : 150 °C. Possibility of shielding for excellent EMI protection. Specific marking possible: Axon batch number, date, customer name, etc. Resistance to fluids (hydraulic liquid, mineral oil, gasoline, diesel). 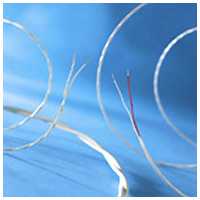 Made up of extra-flexible tin plated copper conductors insulated with FEP or Axons special high temperature thermoplastic ASC15 and including separating tapes. Available in sections 13/25/36/50/80/125 mm². The cable can be shielded for EMI protection. Axon' offer an extended range of high voltage wires from 8 kV DC up to 22 kV DC. Operating voltage applicable from sea level to 21 000 m (70,000 ft). Insulation: FEP or FEP coating with silicone. In Airborne, Space, Military, Medical. Irrespective of the application, Axon' is able to offer interconnect systems terminated with different types of connectors. Axon’ has developed different components for data bus transmission systems for on-board aeronautic, space systems and military applications. 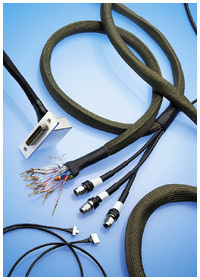 Axon' design and manufacture all components (cables, couplers, connectors, …) used in data transmission systems in compliance with the MIL-STD-1553 standard. This is the protocol of dialogue for strategic on-board systems for aeronautics, space and military applications. The range of products is called axobus®. Axon’ together with addix, the elastomeric subsidiary of the group offer silform® flat silicone cables and assemblies. They have been designed for applications where high density cabling with severe environmental conditions has to be located in restricted spaces. AXON' offers a high speed 10 Gb/s Micro-D Ethernet link for severe environments. It allows 80% connector weight and space saving with improved performance compared to RJ45 connector integrated in a MIL-DTL-38999. Axon' offers cat.6a RJ 45 assemblies for reliable 10 Gb Ethernet. The RJ45 system incorporates a 38999 series III metal shell with full 360° EMC and mechanical protection. It has been designed to meet the requirements of high speed Ethernet connections. Axon' also offers a high speed 10 Gb/s Micro-D Ethernet link for severe environment. Sealed to IP 67 for fluid and dust environments. 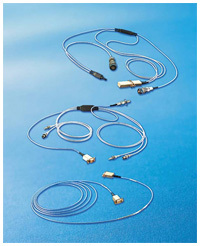 ESA wires and aluminium wires. They have been specially designed for on-board equipment in space applications. They meet the most stringent constraints required by those applications. Axon' has developed a range of aluminium wires, axalu®, which can replace traditional copper allowing substantial weight savings.